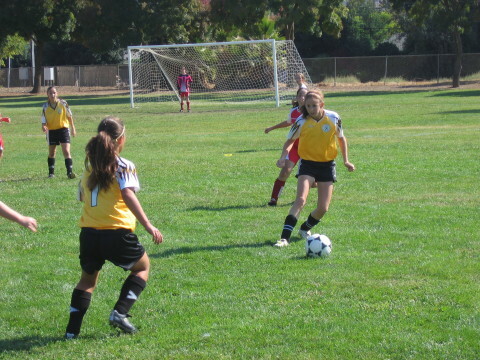 When Chelsea was younger, I used to take her to soccer practice on Tuesdays around 5:00. 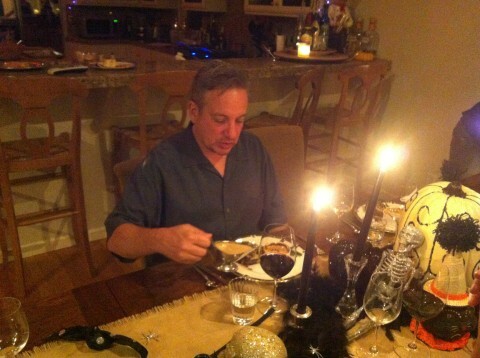 Chris was still at work so he’d be left to fend for himself for dinner. Chelsea and I would be headed home around seven and often times I would call my friend Laurie on the way to see what she was making for dinner! Laurie is a truly amazing chef…a home chef, mind you, but nonetheless amazing! On more than one occasion, Chelsea and I were invited by Laurie and her husband Dave for dinner, although most of the time I think we tended to invite ourselves! So one night when Chelsea and I had stopped over on a Tuesday and been fed a lovely dinner, we were asked the next day by Chris what Laurie had served us. I told him Filet Mignon with Bearnaise. “What?? ?”, he asked, “Dave gets Filet and Bearnaise Sauce on a Tuesday? ?” Well yes, these are the kinds of meals she serves on a daily basis. Over the years, we have been served so many wonderful meals by Laurie, that I knew I wanted to include some of her recipes in my blog! Recently, Laurie had us over for one of her “saucy” dinners, this time Filet Mignon with a Peppercorn Sauce. I presented the idea of featuring some of her recipes, including her wonderful Filet and Bearnaise dish. She quickly came up with the name, “Tuesdays with Laurie.” I love it!!! I’m including both of her recipes for Filet and Bearnaise and Filet with Peppercorn Sauce, they are both equally delicious. 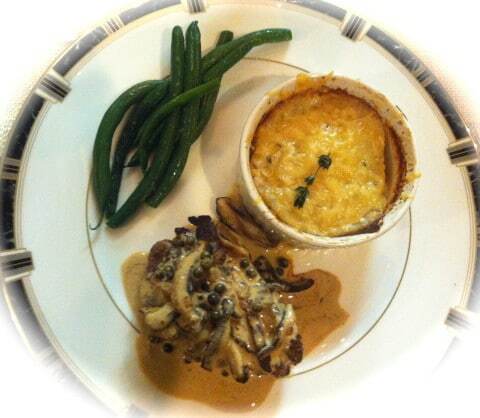 Above, Laurie served Steak with Peppercorn Sauce, Green Beans and Potato Gratin in individual ramekins. The Potato Gratin was a perfect pairing, I’ll be sure to include that recipe next time!!! Dave, you are a lucky man. Jeffrey (husband to Ina Garten aka The Barefoot Contessa) has nothing on you!!! 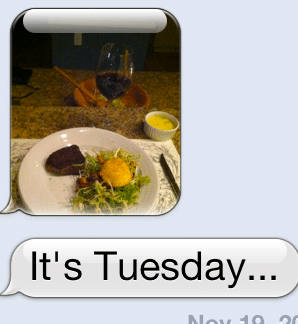 Look at the text I got last week..Steak and Bearnaise on a Tuesday!!! Stir egg yolks, lemon juice and wine vigorously in a double broiler. Add ¼ cup of the butter. Heat over very low heat, stirring constantly with wire whisk, until butter is melted. Stir in remaining butter in pats, whisk over low heat until thick, about 15-20 minutes. (Be sure butter melts slowly as this gives eggs time to cook and thicken sauce without curdling.) After sauce thickens, stir in tarragon. Serve hot with filet mignon. This fool proof sauce is based on a Betty Crocker Recipe. It always turns out perfect! Boil stock in small saucepan until reduced to ¾ cup, about 7 minutes. Meanwhile, melt butter in large skillet over medium-high heat. Season steaks with salt and pepper. Cook steaks to desired doneness, about 4 minutes per side. Transfer steaks to plate. Add chopped shallots to same skillet and sauté 2 minutes. Remove from heat. Add reduced beef stock, 1 cup whipping cream, 3 T. Cognac and green peppercorns. Boil until mixture thickens to sauce consistency, about 6 minutes. Season sauce to taste with pepper. Spoon sauce over steaks and serve.